Japanese designer Kazuki Kuraishi has currently been a source of creative talent in the footwear sphere of fashion, and the latest release from his ongoing collaborative project with adidas is no exception. Following a recent preview of the “Stan Smith M” silhouette from the ObyO KZK line, adidas presents a fresh colorway for their moccasin/sneaker hybrid, the ZX Mocc. The shoe features a sand-colored suede upper complemented by a white glossed leather heel that is finished with a subtle plaid accent. The whole shoe is brought together by the ZX sneaker sole, which provides a necessary combination of comfort and durability. 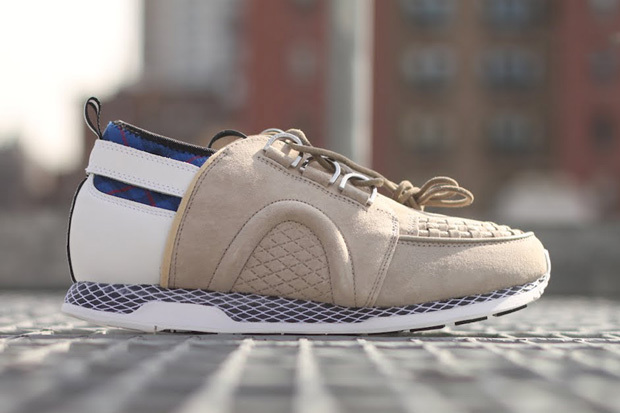 Look for the ZX Mocc to release soon from select adidas ObyO stockists including West NYC.